Masatake Shinohara was born in 1975 in Kanagawa Prefecture, Japan. After graduating from the Faculty of Integrated Human Studies, Kyoto University, he went on studying at the Graduate School of Human and Environment Studies of the same university for a doctoral program. He currently serves as a specially appointed associate professor at Osaka School of International Public Policy, Osaka University. 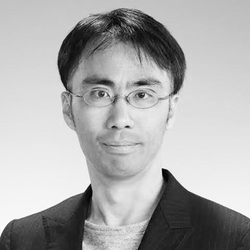 His publications include Kokyo Kukan no Seiji Riron [Political theory of public space] (Jimbun Shoin, 2007), Kukan no tame n i : Henzaika suru Suramuteki Shakai no Nakade [For spaces: In omnipresent slum-like world] (Ibunsha, 2011), Zen-Seikatsuron: Tenkeiki no Kokyo Kukan [All theories of living: public space in transformation] (Ibunsha, 2012), and Ikirareta Nyu Taun: Mirai Kukan no Tetsugaku [New town that would have survived: philosophy of future space] (Seidosha, 2015). In 2016, he participated in Venice biennale as a vice-curator of Japan pavilion. He contributed to formulate the main conception of “En”, and to become a mediator through which plural architects communicate and share the idea.